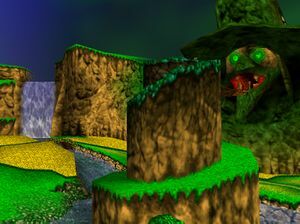 Spiral Mountain with the entrance to Gruntilda's Lair visible. Spiral Mountain is the tutorial area where you learn basic moves about the game. The most important things to find here are some Golden Banjos, Empty honeycomb pieces, and Bottles' moleholes. If you accept training, you will need to find the moleholes, to learn the basic moves. Aside from camera control, these moves are close to a honeycomb piece. Use to run out of the gate. There you will meet Bottles, who tells you what just happened to your sister. Bottles recommends that you should learn some basic moves before going inside Gruntilda's Lair. If this is your first time playing this game, press when prompted to accept training. Otherwise, press for instant access to the lair. 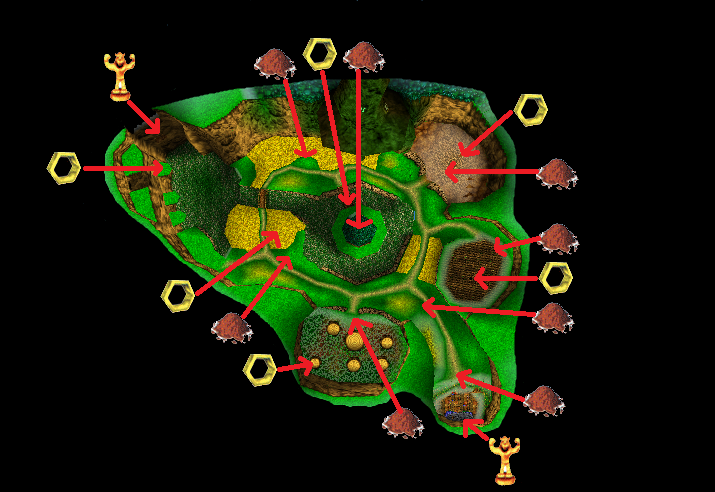 If you choose , you can climb up a spiral in the middle of the level to go inside, but if you are concerned about your health, or you are a completionist, then you should be collecting six honeycombs here, whether you accept training or not. He will tell you about the controls, so listen (or read) up and well. Follow the path until you go to a crossroad. To your left is a mole hill. Move toward it and press to talk to Bottles. He will tell you about camera controls. You should go around the place clockwise if you accept training. So head left. The first area is full of tree stumps. Speak to Bottles under a molehill to learn jumping abilities. Practice jumping by jumping on logs. At the back of the area, the log on the right has the first Honeycomb of the game. Collect it. After you are done with the area continue going around the spiral. Go to the molehill to learn about surface swimming and diving. Swim on the moat around the spiral look for a bridge. Under it is an alcove in the spiral side of the moat. Dive down and collect the second Honeycomb piece and learn to swim underwater. Head up the surface and head back from where you entered the water and up accessible land. Continue up the path but before you cross the bridge there is another pond with waterfalls. There are green platforms along the waterfalls. Flutter-Jump the platforms to acquire your third honeycomb piece. Before you continue on, there is a hidden Extra Life behind the waterfall to the right. Head back to land and then you can cross the bridge. There is another molehill along the way, so talk to it to learn climbing. Head back across the bridge and switch to first-person view. Look on top of one of the trees. There is a Honeycomb Piece floating above it. Climb the tree and Flap-Jump to collect the forth piece. Go back to your last molehill and continue on past it. You will see an area full of rocks called Quarries. Talk to Bottles to learn about Beak Barge. Use the move to destroy the Quarrie to take the fifth Honeycomb Piece. Go back to the path and follow it to the last area, the garden. If you are not training, just defeat a lone Colliwobble. If you are, talk to the molehill to learn three moves called Claw Swipe, Roll Attack, and Rat-A-Tat Rap. Use them to defeat Two Toppers, Two Bawls, and Two Colliwobbles, respectively. Either way, collect the last Honeycomb Piece. Now watch as your energy bar increases by one honeycomb. Now you are ready to go to Grunty's Lair! Head up the Spiral (using a ramp near the area of the Quarries). Climb the spiral to the top, here Bottles will tell you he will teach you more moves along your way through the game. Now cross the bridge and inside the mouth of the ugly bust and let the adventure begin! The First Honeycomb Piece is located in the Spiral Mountain pond, underneath the bridge. The Second Honeycomb Piece is obtained by using Beak Barge on the rocks to the right of the level. The rocks are identified by their eyes. The Third Honeycomb Piece is located inside Collywobble, a floating cauliflower, inside the garden. Attack it with Rat-A-Tat to get the honeycomb. The Fourth Honeycomb Piece is located on a stump to the left of the level. Use the Flap Flip Jump to get on top of it. The Fifth Honeycomb Piece is located on top of a tree. Climb up it jump to get the Honeycomb. The Sixth and final Honeycomb Piece is located near the waterfall at the back of the level. Use the double jump to reach it. The First Golden Banjo is on top of Banjo's house. 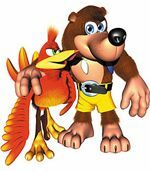 The Second Golden Banjo is inside of the waterfall. Just jump along the green platforms until you see the Golden Banjo inside of the waterfall. Use the double jump to get it. This page was last edited on 16 January 2016, at 19:49. This page has been accessed 56,481 times.